cats, including photos of my Queens, Ladies-in-Waiting, Studs, and Kittens. I have been involved with a love affair of Abyssinian cats ever since I fell in love with my first ruddy Abyssinian kitten almost eighteen years ago... my beloved T-Rex. Sadly, he passed away this past summer...until then he cuddled up with me every night, paws around my neck, and gave me big slobbery kisses with a mischievious twinkle in his eyes. From that moment on, I was hooked. fell on me, and it became my goal to someday own, breed and show the results of my own version of aby heaven materialized here on earth. to succeed in breeding the perfect Abyssinian Cat. 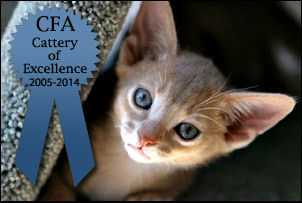 Thanks go to all my friends and fellow Abyssinian breeders who have helped me along this fascinating journey. bred with GC NW Gulfco's Sweet Talkin' Guy of Alexy, DM, produced two beautiful fawn Abyssinian Kittens. The experience is all that I had hoped it would be and more. These Abyssinian Kittens are, in my biased opinion, little angels, only now they are big grown up angels! Time will tell if I succeed with my goal, you will be the judges, but, in the meantime, this journey has blessed me with hours of happiness, joy and positive feelings about the future that lies ahead of my Abyssinian Cats and me! Studs, Pets, Kittens, and Cat Photography. Please don't forget to check out our companion site www.picturepurrfect.com to see pictures, photos and videos of our more recent Abytopia Abyssinian Kitten litters. Thanks for visiting Abytopia. I'd love to hear from you at any time.